This activity is designed to be done at five stations. The activity is designed around students using 3 x 5 or 4 x 6 index cards with grids on them. These can be purchased at most office supplies stores in packages of 100 cards. Students visit each station to develop a formula or work with formula. •	Station 1: Students use index cards with grids to draw two different rectangles and discover how the number of squares in the bottom row and the number of rows can be used to find the area and perimeter of the rectangles. •	Station 2: Students use index cards with grids and begin by trimming any partial squares off the edges of a card. 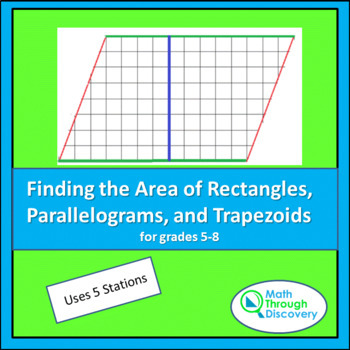 By following directions at the station they create a parallelogram from the card and discover a formula to find the area of the parallelogram. Student approximating the length of any non-vertical or non-horizontal sides and find the perimeter of the parallelogram. •	Station 3: Students make various quadrilaterals and fill in the missing base, height, or area. •	Station 4: Students use index cards with grids and begin my trimming any partial squares off the edges of the card. By following directions at the station they create a trapezoid from the card and discover the formula for the area of a trapezoid. They also consider the perimeter of the trapezoid by approximating the length of any non-vertical or non-horizontal sides. 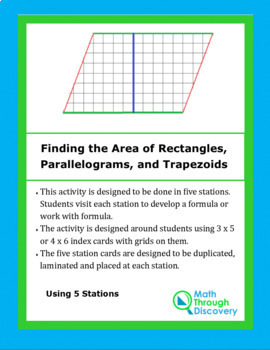 •	Station 5: Students make various trapezoids and fill in the missing bases, height, or area. The directions for the five stations are designed to be duplicated, laminated and placed at each station. A complete set of answers is included.